Report designers often find themselves needing to create a report that is sorted, based on the sum or count of some field in a Dynamics NAV table. This "sort by sum" technique is an advanced capability - and, once you understand the process, is one that the Jet Excel add-in can easily perform for you. Here is a step-by-step example of the technique using customer numbers and the sum of the Amount field in NAV's Cust. Ledger Entry table for each customer. This video provides an in-depth look at the sort-by-sum technique available for Dynamics NAV. Currently, our NL(Sum) function references the customer number in cell E4. 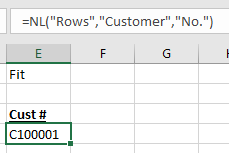 Since we are going to use the NL(Sum) function inside of the NL(Rows) function in cell E4, we cannot refer to cell E4 to get the customer number. We'll need to get it directly from the database. This is where the NF() function comes in. When the report is run, the NF() function will retrieve the No. field from the current Customer record [retrieved by the NL(Rows) function]. note that it currently returns #VALUE! That's OK, we're not done, yet. With that function selected, click the Quote button on the Jet ribbon. This is a little more difficult to read, but you would not have to keep the NL(Sum) function in a separate cell. Both techniques work. When the report is run, you have a list of customers which is sorted (largest to smallest) by the sum of the customer ledger entry amounts. 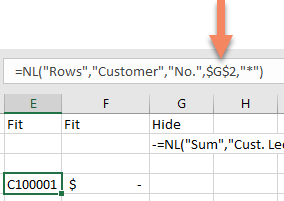 Because the NL(SUM) function is contained within quotation marks, Excel considers the value returned to be text (not a number). will return only those customers whose sum is greater than 100,000. Let's look at an NL(Count) example that also includes extra cell references. Again, we start with a basic report that shows our customer numbers and the count of the number of transactions. Note that, this time, there is an additional filter (Business Group Code) that references another cell. This will require an extension to our technique. The next steps are the same as steps 3 through 6 listed above for the NL(Sum) example. Next, we need to make sure that the reference to cell $C$3 is recognized as a cell reference, and not just text. This requires the use of some extra quotation marks and the & symbol around that cell reference. ="-=NL(""Count"",""Cust. Ledger Entry"",,""Business Group Code"","""&$C$3&""",""Customer No."",NF(,""No.""))" 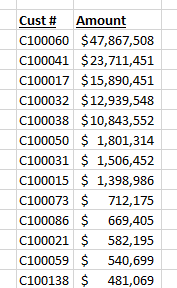 Which allows for the word "Corporate" (from cell C3) to be included in the filter of the NL(Count) function. You can then, just as was done in step 7 above, add a filter to the NL(Rows) function in cell E4 by either embedding the modified NL(Count) or using a cell reference to the function in cell G2.